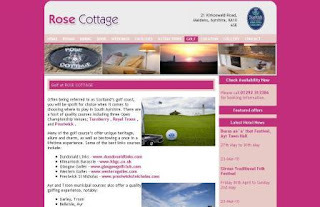 When we at The Edge developed our SiteBuilder Lite and the subsequent Open Rooms CMS Website package for accommodation providers it was always with the veiw that as an entry level pacakge it should provide good solid design backed up with easy to use content management and supplemented by strong SEO from the outset. If ever there was an exampale of what we were trying to achieve it's been over the past few days with new business Rose Cottage in Maidens. The cottage has been bought by Guy and Jo Redford and will be let out to families and golf groups seeking quality self catering accommodation a mile from Turnberry. Following agreement to go ahead with the development of an Open Rooms website on the Friday the site has already gone live on the Tuesday with new domain name, content, imagery and every page tagged and submitted. The cottage now has its own Google account complete with Picasa Gallery, Google Analytics account and content managed website. There is no reason why any tourism business regardless of how small should not have a porfessional presence on the internet. Jo provided us with about ten pages of copy and a couple of dozen digital images of the preoprty which gave the feel for both the product and the market place. In return we've produced a high quality entry level Content Managed website which they can now drive forward. It is anticiapted that they will add Bookassist online availability in the next few weeks and the availability checker jsut simply drops into the site. If you are a self catering operator in Scotland or indeed beyond and you haven't looked at your online marketing strategy in the past couple of years you really could do worse than have a look at what an entry level website should comprise of. All the very best to Jo and Guy from the Edge!